I would be surprised if JS didn’t roundly beat Python or Guile on this one. One thing I didn’t measure (and don’t really have a good way to measure) was the message passing overhead. The web worker specification says that the objects passed in messages between workers have to be serialisable as JSON. This is because workers run in different interpreter instances to the main thread and the implementation won’t necessarily let you migrate objects between instances. So it is likely that some period of time is being spent on JSON encode/decode for each line generated. @Roumano: I think that is just a case of hitting the precision limit for the floating point type used by the interpreter. I’m not using any special high precision arithmetic library, so it isn’t surprising that that happens. Hmm, if you implemented it more like Xaos it might be faster and nicer. @foo: it isn’t surprising that a native code implementation runs faster. I was doing this more as a way to practice parallel programming in the context of browsers. @Hans: I guess that would make things a bit nicer to use. It would probably only take a function to remap the value of the line counter when sending jobs to the workers. Looks great, and nice code. With safari I’m maxing out 8 cores. Nice. James can you contact me directly? I have a question for you (about publishing some of your code). Jake, canvas is now widely supported by pretty much all modern browsers. @Jake: I’d imagine the SVG method would be a fair bit slower and more memory hungry, since you’re asking the browser to create a DOM node for each pixel in the image, while with the canvas I just need to update the RGB image data associated with the single canvas element. You could still apply web workers to parallelise the calculation in your implementation. While there are areas that are obviously lacking detail due to the iteration limit I set, there are other areas of the image where I hit the floating point precision limit first and the image becomes blocky. I imagine you could find areas in your version that exhibit this. Thanks James and Eric for your comments, it’s helpful to understand some of these speed issues. I’ll get working on learning canvas. I now have learned enough about Canvas to re-do my Mandelbrot generator using it. It is much faster, and I’m pleased with the result. I don’t know about web workers (I’m only a maths teacher), maybe that’s the next step. 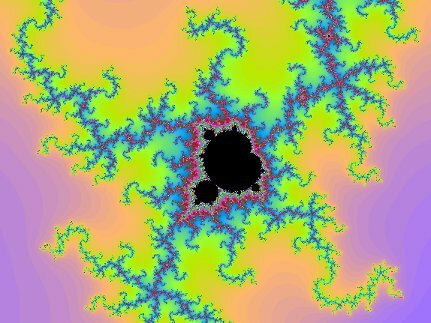 In case you want to try my Mandelbrot, here it is: http://www.jakebakermaths.org.uk/maths/mandelbrot/canvasmandelbrotv12.html. It works on Chrome, Firefox and IE9; I don’t know about Safari or Opera. I slightly derived your code to try to make it more “education ready”.